In a play that moves faster than a lightning bolt, a peace mission of such gravity and complexity is a delicate task. 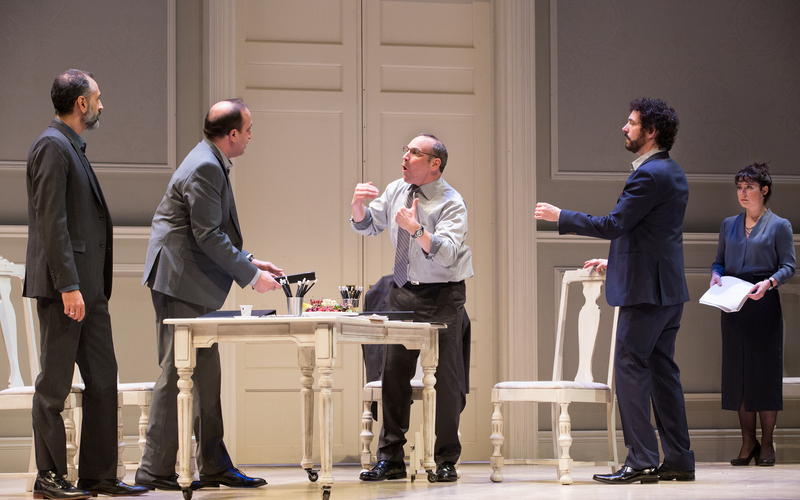 No theatre company can achieve this better than Studio 180 with director Joel Greenberg elevating human behavior to a higher farcical plateau. Oslo plays the CAA theatre until March 3, 2019. Peace. Nations want it but few can maintain it. Conflict. No one wants it but everyone gets stuck with it on one political level or another. With the perpetually disappointing reality that no two parties with fixed agendas can sit down for a positive outcome on either fronts, along comes a playwright to paint a vibrant fact-based theatrical portrait that illustrates the impossible is achievable when reasonable expectations are accommodated. J.T. Rogers’ award winning Oslo, a dramatized roadmap to peace between Israel and its Palestinian neigbhours now being given a supreme staging at the CAA theatre, is a perfect example of what exemplary ensemblers can do to a sound historic story foundation that brought foes together for a better tomorrow. Fully convinced that existing negotiation models are fundamentally flawed, he relies on a new process and constructive ambiguity to keep proposals on track for a fascinating observatory activity to bypass contentious wrinkles that lay ahead. Pact with powerful principals and advanced logic, the character design and scene delineation that advances the play is what truly makes Oslo both captivating and compelling in its drive for what feels like an unobtainable diplomatic solution. All of which is derived from Norwegian government back channel communication and zero superpower influencing. The ‘what if’ arena generates promising results with cooler heads prevailing in momentum building Act I. By the show’s second half, cracks slowly start to appear with stagnation and frustration growing among key participants unable to reach a consensus. Step by step, the unimaginable unfolds through cautious trust and a sapient spirit of accountability. The hopeful message of ‘may the eyes be opened to the new’ is a triumphant theme tabled in this remarkable drama. Yet it’s comically engaging framework is what titillates and enthralls from start to finish. Be a part of theatre’s vital undertaking and deep dive into Oslo for a brilliant merging of political minds and transcending art.